"I’m Not a Beer Drinker. What Else Do You Have?" Bartenders or servers might roll their eyes when they hear that statement and implied question. It’s true that craft brew is very popular, with an estimated 110 breweries reported to be open in Minnesota by the end of 2015, compared to just 5 back in 2005. Beer drinking has become much more than what you do at a ballgame or in a backyard, it’s become a pastime, an event, a reason to gather, and a hobby for the very passionate. But with the hype and craze come those consumers who love the beer scene and partaking in all things beer, however they don’t drink beer. Hard cider is the answer to that and having an option like hard cider on tap is the answer to this question. What’s the Difference Between Beer and Hard Cider? Everything. Beer is made by fermenting malted barley and flavoring it with hops, as well as, unique herbs, spices, and fruits. Hard cider is produced when apples are pressed and their juice is fermented into an alcoholic version of apple cider. Even though the two products are very different, they do share some similarities. Along with craft beer, hard cider is available from dozens of different brewers, comes in cans, bottles, and kegs, and there are also “cideries” just as there are breweries where you can take a tour, get a flight or even purchase a growler. One of hard ciders more popular attributes is that it lacks gluten. Gluten is a protein found in wheat, rye, barley, and other grains that give those properties their shape and binds them. Gluten intolerance, aversion, or Celiac’s disease has steadily been on the rise for years. It’s estimated that a decade ago, gluten intolerance affected one out of 2,500 people nationally, while today it’s closer to 1 out of 133 people. Those numbers affect businesses that serve consumers and appealing to people that live a gluten free lifestyle is important to your bottom line. Offering hard cider on tap ensures you have the means to be inclusive of this group of consumers. At Bernick’s, we offer a wide variety of hard ciders including Angry Orchard, Lazy River, Crispin, J.K.’s Scrumpy, Possman, Somersby, Sonoma and Woodchuck. MillerCoors released Smith & Forge last year, and we carry that, too. Strongbow, a subsidiary of Heineken, has been produced in differing capacities since 1962. When you’re ready to add hard cider on tap or expand upon your current offerings, let us know. We’d be happy to help you out. And, if you’re still uncertain that hard cider is all the rage, visit us at Ciderfest St. 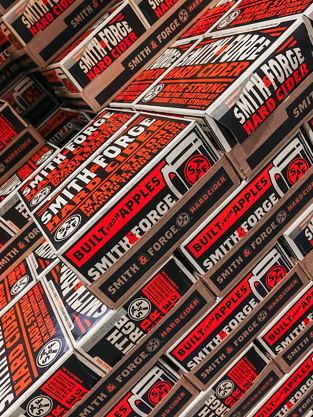 Cloud Saturday, August 22 where we’ll be promoting the event sponsor Smith & Forge and celebrating all things hard cider. Cheers!